6000 Series 8kg Condenser Dryer is rated 4.1 out of 5 by 17. The 8kg condenser dryer with ProSense, 2 energy star rating, OKOFlow filter system and Duvet program. 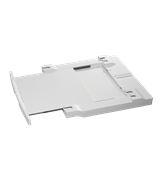 ProSense technology uses advance humidity and temperature sensors to adjust the drying time and energy consumption to suit individual loads whether its a days or a weeks worth of drying. This saves time and energy whilst gently protecting the clothes that you love and wear every day. The XXL soft pattern drum in combination with the efficient airflow circuit means a more uniform, gentle drying result. 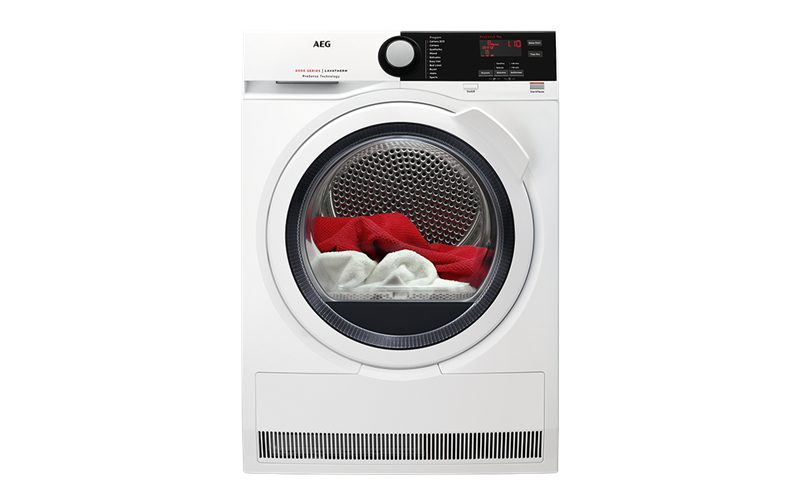 AEG dryers come with an efficient, single filter that is easy to reach and clean. The streamlined airflow dries every load seamlessly and maintains the dryers effectiveness and energy efficiency. With AEG, you have 4 options on where you position your door handle making the machine fully customisable to your laundry needs. Rated 5 out of 5 by kyl72 from Super sophisticated with great features We are Super happy with our AEG washer & dryer stacker set, sleek and sophisticated design. Rated 5 out of 5 by Meggles from New Acquisition Never written such a quick review but this very quiet machine looks terrific and has dried out everything from Sydney’s unbelievable flash flood on 27/11/18 A Godsend in a flooded house! Rated 5 out of 5 by Romoe888 from WOW!!! washing made easy! When shopping for a new washing machine I had decided from a choice of AEG and two other brands. But what made me choose AEG was the simplicity of use, it has everything I wanted plus more for a lower price than the others, with the added benefit of 5 year warranty, free delivery and full installation, no need for me to read installation manuals. And, on top of all this, it's a great looking machine which gives great washing results. The best!! Rated 1 out of 5 by Madge28 from Total waste of money I bought this dryer in July of this year and assumed I was investing my money wisely. The dryer is a total waste, unless you want to put your clothes in straight from the machine, and even at that they are still left feeling damp. I would never recommend this product and unfortunately now rarely use it. Rated 4 out of 5 by JJ1234 from Mislead by sales person. Good product tho From the start I purchased this because I was told the doors would open hinge on right and open that side, when it was delivered I was told I would hav to call service but they didn't think this was possible ? Happy with the product just feel mislead as our laundry isn't big enough or set up for the doors (both washer and dryer) to open the way they do.